A dental abscess is a bacterial infection that can be painful or not, and usually containing pus. 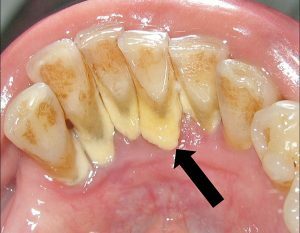 This type of infection is usually located in the edge of the root of a tooth, or at the gum level around a tooth. 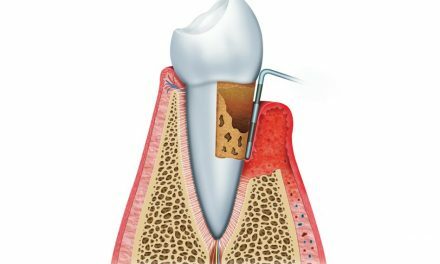 For an abscess to develop, a tooth must either break, or have tooth decay which would have reached the pulp, the central cavity of the tooth. If the infection comes from the gums, the abscess occurs due to periodontitis (gum disease). 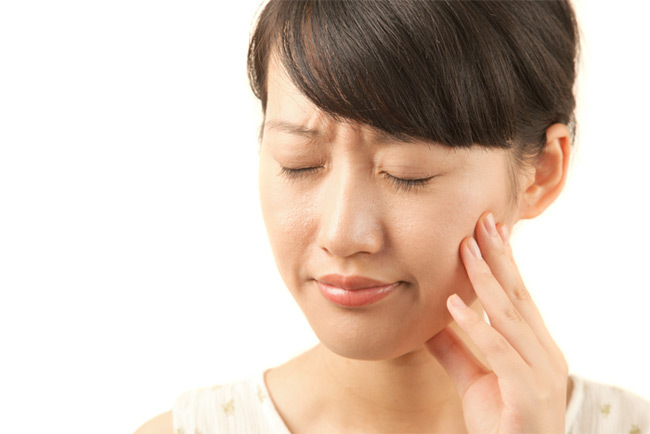 If not treated, A dental abscess can reach the jawbone and cause severe complications. 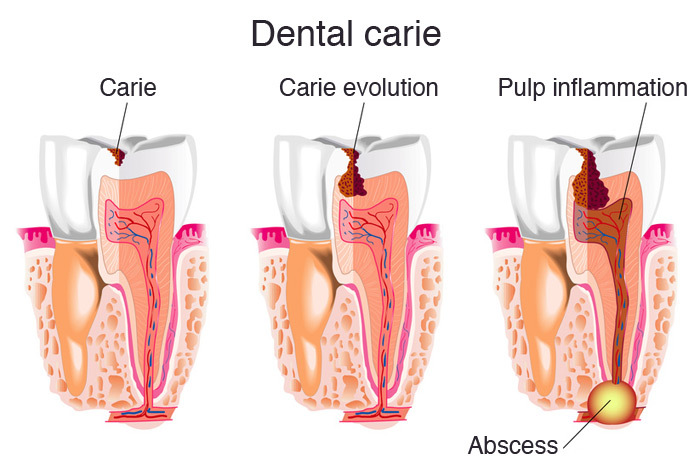 A dental carie (cavity or decay) is a bacterial infection of a tooth. When it is small and limited to enamel or dentin, it can be repaired by a filling or by an inlay or onlay if necessary. But when the decay reaches the pulp (where the nerve is located), the pulp becomes infected and an abscess may develop at the edge of the root (apex). It’s important to note that a carie and an abscess may develop slowly without causing any pain. But if the infectious expansion is suddenly accelerated, it can cause swelling and a lot of pain. 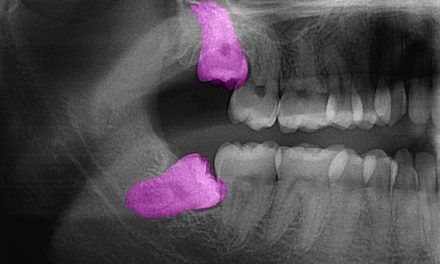 The best way to detect a cavity or an abscess is by undergoing a dental exam by a dentist with dental x-rays. If someone has poor oral hygiene and dental plaque is not remove regularly, this plaque can become tartar which sticks to teeth and gums. Tartar can accumulate and cause inflammation and infection of the gums. If tartar is not removed by a dental cleaning, it digs slowly through the gums, and destroys the bone that holds teeth. 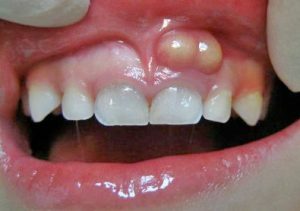 This condition is called periodontitis. It’s a disease that can generate an abscess at the level of the gums with swelling and pain. But periodontitis can also develop very slowly without pain but by destroying bone. 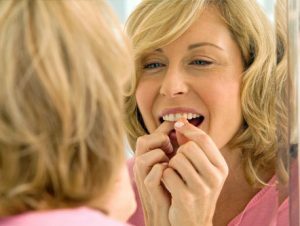 The tooth then moves more and more until it falls off by itself or needs to be extracted. Headache, fever and general fatigue. A significant amount of green and foul-smelling pus that eventually drifts out and the pain stops right after. A fistula is an opening that appears on the gum when the abscess is chronic. The pus drains out in the mouth by itself. When there is a fistula, the pain generally decreases, and you may see a small red or white button on the gum. Tooth loss may occur because the abscess can infect the bone that holds the tooth, and if too much bone damaged (periodontitis), the tooth moves more and more and eventually falls out. Brain abscess may occur. The infection could spread from teeth to the brain through blood vessels. An infection of the brain can lead to a coma. Sinus infection can take place since the roots of upper molars are located near the sinuses. If the dental abscess produces pus, sinuses may fill with pus that comes from teeth. Bacterial endocarditis may occur when bacteria from a dental abscess reaches the heart through blood vessels. These bacteria reaching the heart may infect it, which sometimes lead to fatal consequences. Ludwig’s angina is a serious infection, and sometimes fatal, which affects parts of the face and the lower jaw. 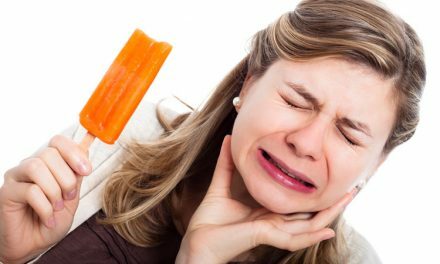 It usually occurs in adults suffering from a tooth abscess that was never treated. The danger is that it can grow enough to block the airways of the person who’s suffering from it, and cause suffocation leading to death. if a tooth is destroyed too much or if it does not have enough bone to support it, extracting that tooth may be necessary. Daily dental hygiene, including brushing your teeth 3 times a day, and flossing twice a day. Seeing your dentist for regular dental exams, preferably twice a year. Regular dental scalings and cleanings. Reducing the use of tobacco products, or stopping altogether. Emergency Dental Care (How to Temporarily Relieve My Abscessed Tooth Pain). Kits Family Dental (Gum Boil in Children – AKA Dental Abscesses). The Queen of Dental Hygiene (It’s all About the Plaque (No Tartar!) ). WebMD (Dental Care for a Beautiful Smile ). You are very welcome Juliet! And thank you for reading! I am a Health Promotion Facilitator with Reproductive Health, Healthy Children and Families (HCF), Alberta Health Services (located in Alberta, Canada). We are a non-profit provincial public health program. Our team is responsible for the development of the http://www.HealthyParentsHealthyChildren.ca, which is a practical guide to pregnancy and being a parent. Part of this work includes print copies of this guide as well as other health promotion resources for families. We would like to know if we could have permission to reproduce one of the images on your website. Please contact me at amy.n.graham@ahs.ca to discuss. Thank you! I buy my images from a website called fotolia.ca, I am not sure how the permission would work. Do you happen to know the ID # for the image of the child’s dental abscess photo? I reviewed the fotolia.ca site but can’t find it. Many, many thanks! Hello Dr. Youssef, i have a recurring abces for years, often with green puss (yuck?). Also after my tooth has been removed, it appears at the same spot. I visit a hygienist regularly and care for my teeth daily. What should I do? 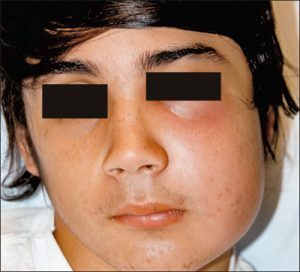 Looking and finding the origin of the abscess is very important. It might be another tooth, or might be coming from the gums. When you do your cleaning with a hygienist, does a dentist check your teeth? Maybe next time you can mention the recurring abscess and have him or her take a look at it. It’s about teeth for God’s sake, and you had to apologize for the gender you used? I hope an asteroid hits soon and wipes out the stupidity! I have had a root canal done and a cap put on my back tooth but every once in awhile I’ll get an abscess on my gums above it some nasty fluid comes out what do you recommend to be done? Your abscess might be either coming from that tooth, or from somewhere else very near that tooth (gums, neighbour tooth or other structure). I recommend that you see your dentist to have it checked and not to wait a long time, as an abscess is not good to have in your mouth.